Ah, Austin. That sweet, funky town in the middle of a state that yearns for my death. I can actually feel its beady little state eyes glaring at me from here, waiting for me to fly over its borders so it can shoot down my plane with its state death ray. Or maybe make my spleen burst. Or - OR - maybe I'll just choke on a Texas peanut. But, I digress. 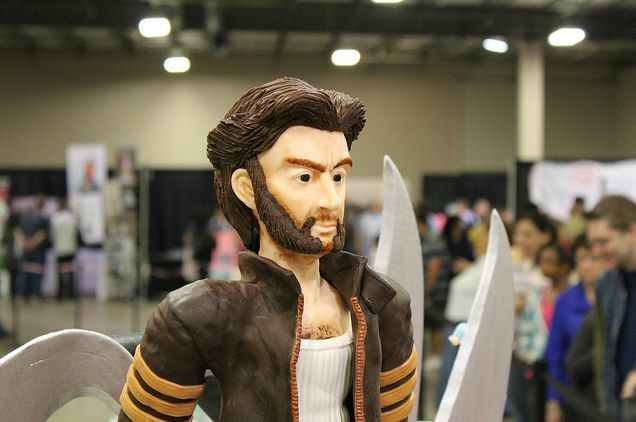 So, apparently, there's this "cake show" in Austin where bakers make cakes and show them. Which is why it's called a "cake show." And apparently, many of these cakes are freaking awesome. Let's take a look, shall we? Ya know, what's most impressive to me is that these bakers actually left the relative safety of their own homes and, as far as I know, Texas did not kill a single one of them. Frankly, I'm amazed. Sidenote: Can anyone confirm that there were, in fact, Official Texas State zombies roaming the streets outside the show? Just curious. I'm pretty sure those are daisies. Wait. I'm being told that it actually wasn't death. (Are you sure? It was in Texas, right? Ok, apparently the theme was "Superheros." Great. Now I have the theme from "Batman" stuck in my head. He looks like he's ready to kill me. Clearly, he is from Texas. Speaking of blue, I've heard that smallpox is especially bad in Texas this time of year. The helmet is to prevent Texas bird flu. Because, if you remember from up there ^, yellow is my favorite color! Those elephants look so life-like! Like they're about to trample me. Clearly, they come from dysfunctional families. Several of the above photographs courtesy of Lynn Moore of Flip Images. 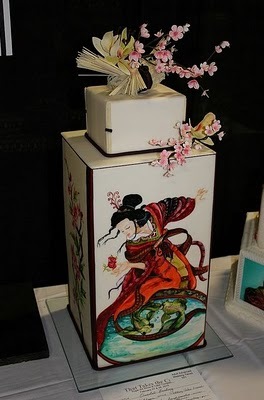 All the cakes are amazing, but the first one...there are no words to express how much I love that cake. It's drop dead gorgeous. I was smile-gasping (is that a thing?) and oohing until I got to the point where it said Death was the theme. Then I literally frowned in confusion. Wow. These cakes are AMAZING! :) I like the safari one at the end. The details on it as well as all the other cakes are phenomonal! 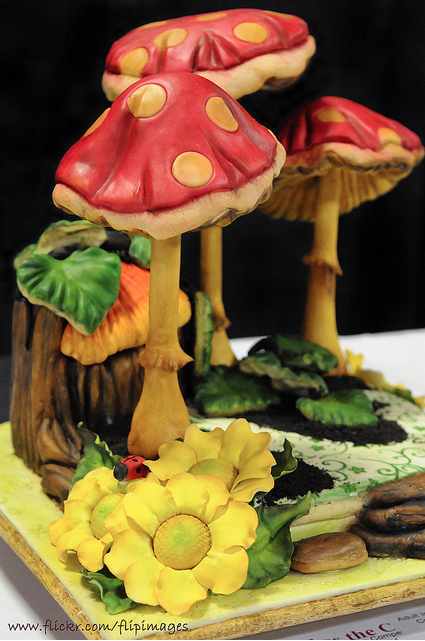 Wow, fantastic cakes! As I scrolled through the images, I held my breath, just in case I found one which was a disaster. Thankfully, they were all incredible! Oh, then after that I started smile-gasping again. March 27, 2011 | Christy S.
I don't think I like the comments about Texas. Get any tourists killed in Florida lately? Clearly the concept of "Don't Mess with Texas" is completely lost on some. They say that's just an anti-litter campaign, but we know better. Some of these totally fit Austin's unofficial motto of "Keep Austin Weird." I'm not saying they're not great, but some of them are kinda weird, especially the death cake and the 'shroom cake, which totally befits Austin! 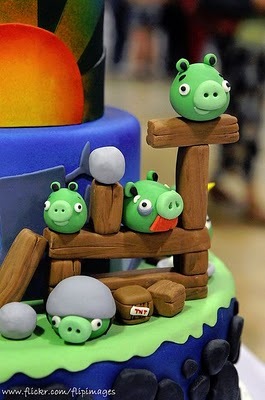 The angry bird and green beheaded zombie pigs cake is nice, but, huh? The African wildlife cake is amazing! Prostect endangered species, like people who can make beautiful cakes. And people who don't have the self-preservation instinct not to dis Texas. I'm actually terrified of today's post. It's funny, Jen and I discussed it at length. Me: "People from Texas are the nicest, funniest people in the whole world! They're totally gonna get it! They'll understand I'm talking about my own near-death experiences, right?" Jen: "Most of them. Then there will be those who hate you..."
Ah well. We'll see how long it takes before the comments and emails get so bad I have to pull it. Oh, please, john (hubby of JEN), don't pull the comments. I'm planning to pop some popcorn and sit down for an hour of enjoyable reading this afternoon. Can't wait for the Texans to rise up in anger today! Do I smell EPCOT? 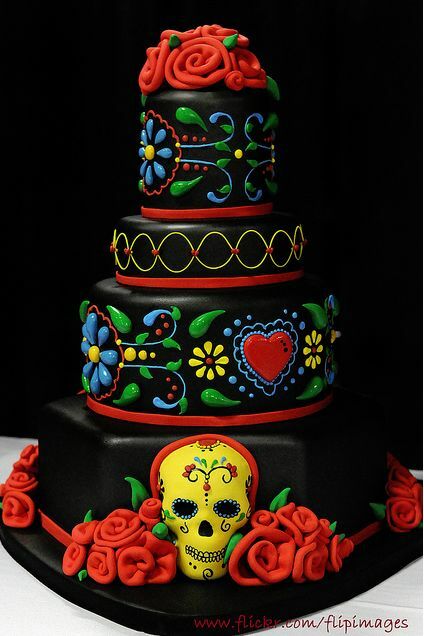 Wow, I would totally have that calavera cake as a wedding cake. (Or I would have if my wife would've let me) It's stunning. If you ever go back to TX, maybe you could see about getting a human-sized hamster ball to run around in for protection. Too much? What's the worst that could happen? I mean, Texas is a big state but we wont lose THAT many readers, right? hahaha, this is so cute!! I read this blog pretty much every day and my favorites are the Sunday Sweets. Wasn't it Texas that nearly killed John a while back? Or have I got the wrong state entirely. I remember reading about your near-death experience during that Cake Wrecks "World" Tour! So glad you survived =). Those Texans sure can make fabulous cakes: the first two blew me away, and I'm really diggin' that Day of the Dead cake, too. And even the ones I didn't love demonstrated an amazing amount of skill. Wonderfully funny post, as usual--thanks for sharing the sweets and the humor! As a proud and native Texan, I must say I love this post. Why? I did remember the umm... incident that John and Jen happened to experience on their last excursion into my great state. Also, the Dia de los Muertos (AKA Day of the Dead) cake was absolutely amazing. The colors are so festive! That Japanese cake is amazing. And for the record, the appropriate word is "wow" (and I know, cause I'm a writer). 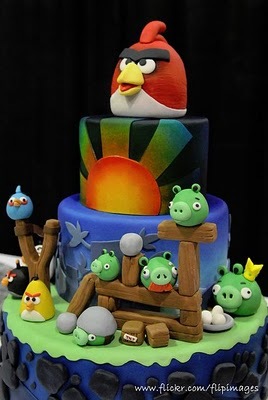 But my favorite may be the angry birds cake. 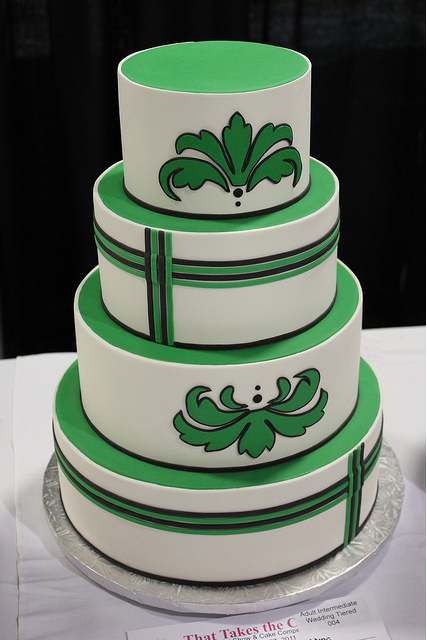 The fondant work is fantastic. 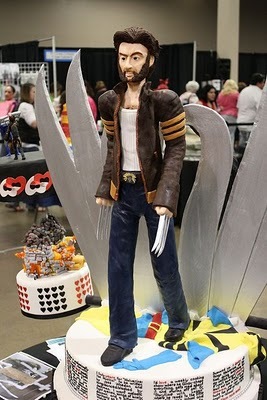 Just one question, the cake show was in Texas, yes? So where are the cowboy hat and cowboy boot and armadillo and road kill cakes? (Okay, that's two questions.) I feel robbed. March 27, 2011 | J. Reading again about your experiences in Texas again (boy, that was scary), I'm glad that you're ok now, John. Having lived in Texas, I believe I'm qualified to 1)grant you permission to joke about it and 2)agree that it has the potential of killing folks. But then, I lived in Houston. I'm sure Austin is a lovely place. Love Sunday Sweets - inspirational! @J - I know the petit lap giraffes are fake, but I ~want~ one! ...and sorry but all that black on cakes isn't for me but I totally appreciate the consummate skills of the cake makers/decorators. Angry Birds!! It makes me so happy knowing that somewhere there is even a cake for this. Bakers amaze me. First off, those cakes are all gorgeous! I'm pretty sure there is now a bruise on the bottom of my jaw, from it hitting the floor so many times. Also, what is it with bloggers, and near death experiences here? I was born and raised in Austin, Texas and have discovered I am incapable of surviving outside its borders. So, I think we natives develop a certain immunity to our state's potency. (And Zombies have been known to randomly wander these parts. Highway 290 was infested last Spring.) Also, the Angry Birds cake was so fun I squealed. I LOVE the Day of the Dead themed cake! I want one for my birthday! Does anyone know what the text around the bottom of the Wolverine cake is? @Mary_B, the petite lap giraffes are fake?! Next thing you'll be telling me there's no such thing as the Easter bunny. I saw the first cake at the Oklahoma Sugar Art show in Tulsa last year. I didn't think they were allowed to re-enter cakes in different competitions. And lemme tell ya - it's even more gorgeous in person! 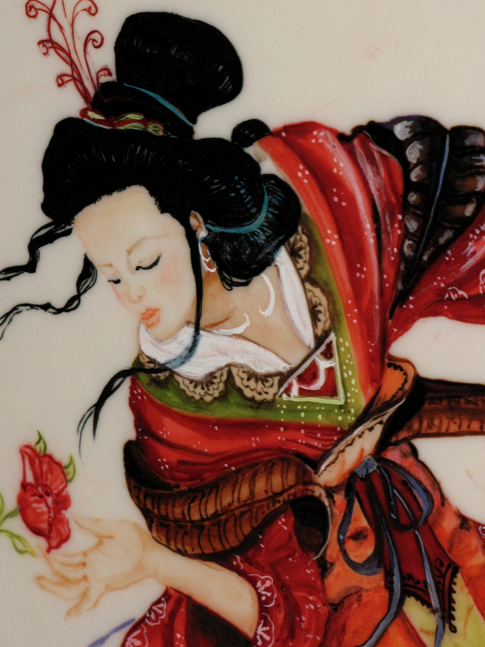 The detail is really incredible, the pictures don't do it justice. I'm from Texas (wonderful San Antonio)and I get the jokes! Don't pull them or edit any. I especially enjoyed the Sugar Skull/Day of the Dead cake, it's so Texas and really beautiful! 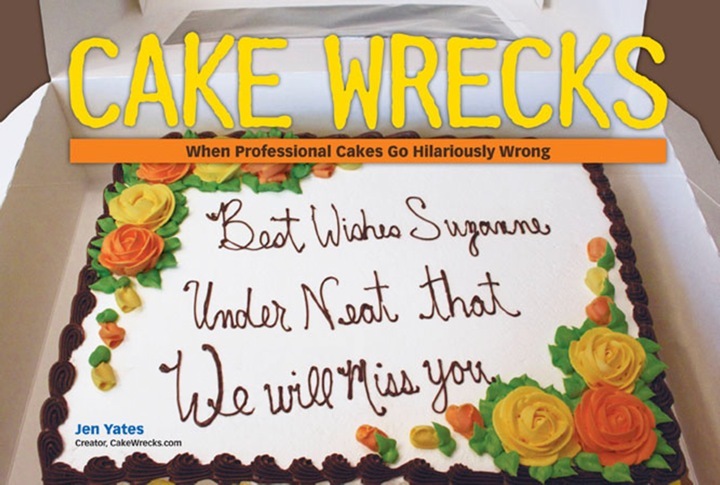 I can hardly wait for a Wreckerator to attempt Cassandra's "split quarters" cake. WV: famsx - We here in the Republic of Texas are famsx fer our guns, uh huh. Those are amazing! Love the blue cake! Please come back to Texas! I'm sure the attempt on your life was a one-time-only deal! Texas tried to kill my husband too. We got doused with water and then got on one of the hyper air-conditioned buses on the way to the Alamo and my husband was wracked with chills and a 24 hour death flu. Loved the Day of the Dead cake. Hopefully you can come back to Texas and have a better experience. Austin is really fun, lots to do and tons of cheap, delicious restaurants. Also, congratulations on not dying! Oh my, all the cakes are amazing! The best was saved until last, though! 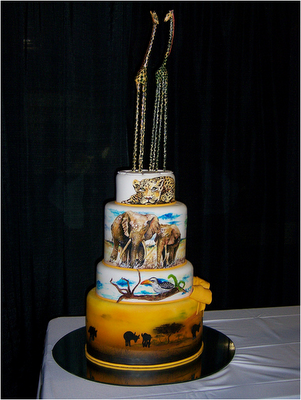 The African cake is just jaw-dropping gorgeous! 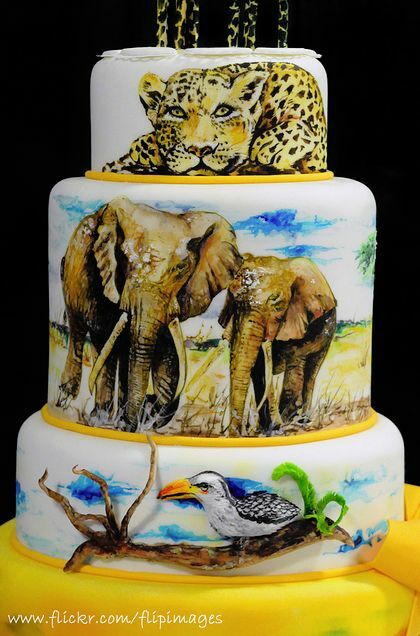 Can someone tell me if those giraffes are pulled sugar, or what on earth they're made of? They're incredible! Those are exquisite! And that first cake - by Susie's Victory Cakes - looks like a gorgeous reproduction of one of my favorite books from when I was a kid - "The Weaving of a Dream" by Marilee Heyer. John, come hang out with me in Texas, and I promise you won't die. We haven't had a smallpox outbreak since, oh, last week? And hurricane season doesn't start for a couple of months. You only have to watch out for chupacabras, but the Botanicas here sell very good chupacabra-repelling charms. Another DFW reader checking in! The Day of the Dead cake is so beautiful. 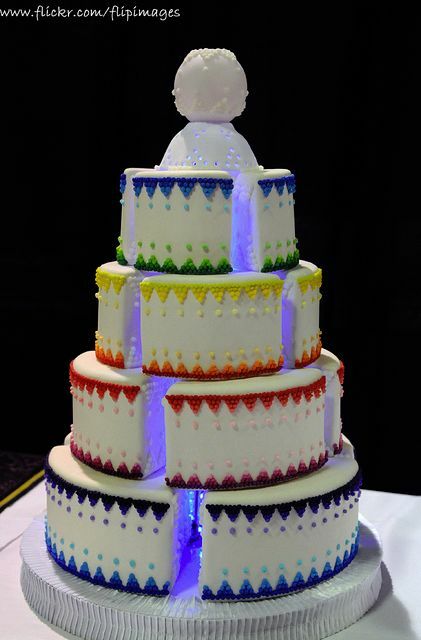 And the interior-lit cake is amazing! I want to hear more about the zombies!!! LOL Anyone? Anyone? Sorry, John-the-hubby-of-Jen, but I've gone to Houston several times from Orlando and TX never tried to kill me so I think it's just you (glad you haven't held a grudge, though). I have no trouble believing TX has a state death ray, though. It's just a big gun, after all. 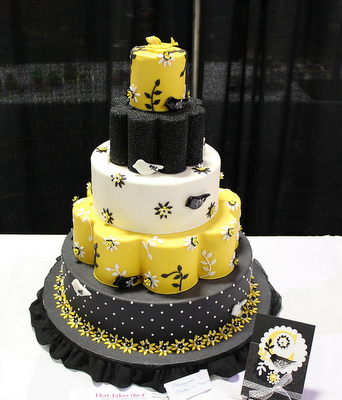 I loved the black cake as it was striking but I can see why that puts some people off.